Public baths are known to have existed in early Egyptian palaces and bathing occupied an important place in the life of the Greeks, indicated by the remains of bathing rooms in the palace of Knossos that date from 1700 BC. However, it was the Romans that developed bathing to high degree of sophistication At first, the Roman baths were designed on a small scale as they were used simply for cleansing after physical training exercises. The balnea developed as private baths or neighbourhood baths. Their popularity encouraged the introduction of public baths, thermae, on a massive scale. These included the Baths of Titus (AD 81), Baths of Domitian (95), Trajan's Baths (c. 100), the Baths of Caracalla (217), and the Thermae of Diocletian. Excavations at Olympia show that from originally modest, functional buildings, with a cold pool, hot slipper baths, and a steam bath, the thermae developed into pleasure palaces. Beginning in the Hellenistic era, their role expanded from one of facilitating cleanliness to one of making life as pleasant as possible. The opulence of the Roman bath embodies the essence of a culture that thrived on pleasure and leisure. Some of the thermae were large enough to accommodate thousands of bathers; the Diocletian bath had a capacity for 6,000 bathers. 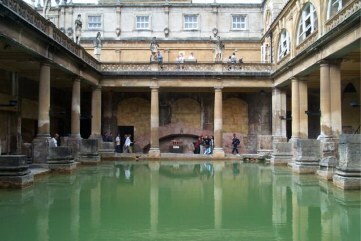 Roman baths were also built wherever the Romans made conquests, and the imperial bathing establishment was repeated in its essential form throughout the Roman Empire. Bathhouses were also provided for the army as far north as The Antonine Wall. Communal bathing in public facilities was, therefore, an important and essential part of Roman life, and formed part of the daily routine for all classes in Rome. Cicero writes “the gong that announced the opening of the public baths each day was a sweeter sound, than the voices of the philosophers in their school”. 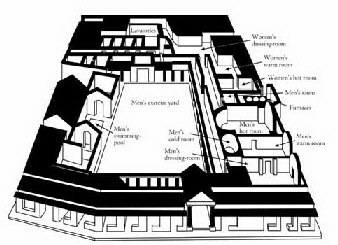 The thermae were all-encompassing establishments acting as social, recreational, and cultural centres. Much of daily Roman life surrounded the thermae and a good proportion of a citizen's day would be spent there. The general scheme consisted of a large open garden surrounded by subsidiary rooms and a block of bath chambers either in the centre of the garden, as in the Baths of Caracalla, or at its rear, as in the Baths of Titus. The main block contained three large bath chambers--the frigidarium, calidarium (caldarium), and tepidarium--smaller bathrooms, and courts. In addition to bathing facilities they would include sports centres, swimming pools, parks, libraries, lecture halls, small theatres, large halls for parties, restaurants and sleeping quarters. Roman engineers devised an ingenious system of heating the baths-the hypocaust by which the floor was raised off the ground by pillars and spaces were left inside the walls so that hot air from the furnace could circulate through these open areas. Rooms requiring the most heat were placed closest to the furnace, whose heat could be increased by adding more wood. Large numbers of people were, therefore, offered an enclosed place that was always warm. At a time when, no matter how cold it became, people had no source of heat at home other than braziers and wore overcoats in the house as well as in the street; the baths were a place to keep warm. Providing social and recreational activities was a basic responsibility for Roman rulers and the larger baths were owned by the state. They were frequently the pet projects of the Roman emperors, and, to ensure their popularity, and the emperor's notoriety, entrance fees were kept to the very minimum. The Roman workday began at sunrise, with work being complete around noon, which was the time when the baths were generally visited. Republican bathhouses often had separate bathing facilities for women and men, but by the empire the custom was to open the bathhouses to women during the early part of the day and reserve it for men from 2:00 pm until closing time (usually sundown). As a rule, men and women bathed separately. Mixed bathing is first recorded in the 1st century AD, and was condemned by respectable citizens and prohibited by the emperors Hadrian and Marcus Aurelius. Women who were concerned about their respectability did not frequent the baths when the men were there, and the baths were an excellent place for prostitutes to ply their trade. The Roman bathing ritual had a standardised pattern and generally regular routine, which the thermae were designed to accommodate. The exception was when bathers were taking the baths as part of a medical treatment, their physician would then prescribe which rooms to visit. The bathers first entered the apodyterium (dressing room) to change from their outdoor clothes, then proceeded to the elaeothesium or unctuarium to be anointed with oil. It was then normal to have a strenuous workout in the large courtyard area (palaestra) at the centre of the thermae, where various sports and activities were available. Exercises would include weight lifting, running, and ball games. After this the visitor proceeded to the series of main bathing rooms that varied dramatically in temperature. The calidarium (hot room), the sudatorium, or laconicum (steam room), where bathers had their bodies scraped of its accumulation of oil and perspiration with a curved metal implement called a strigil, the tepidarium (warm room), the largest and most luxurious in the thermae, and the frigidarium (cold room), where there was frequently a swimming pool. The bathing process was completed after the body was again anointed with oil. After their baths, patrons could stroll in the promenades and gardens, visit the library or museum, watch performances of jugglers or acrobats, listen to a readings by poets, philosophers and politicians, or buy a snack from the many food vendors. They would meet friends and conduct business. Life at the baths was like life at the beach in summertime; the greatest pleasures were to mix with the crowd, to meet people, to listen to conversations, to tell stories, and to show off. The buildings were among the most splendid and expensive of the imperial works, and made the splendour of a royal residence accessible to all. Lounges with covered colonnades for relaxation and socialising were provided. Writers frequently comment on the beauty and luxury of the bathhouses, with their, rich furnishings, high vaulted ceilings, brightly coloured mosaics, paintings, marble panels, and silver faucets and fittings. Christians and philosophers denied themselves the array of pleasures available at the thermae, or the "Cathedrals of Flesh," as they were known by Christians.